Nice enough If a bit rough round the edges, also a music venue. The stage doubles a s a place where people sit at tables when no band is on. Am surprised with the current 'claim culture' no one has fallen off and sued them. 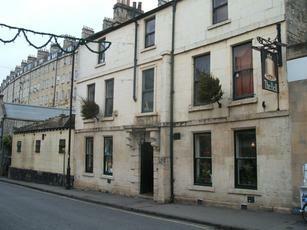 Ale was good and pub is only a short stroll from town and close to the Pulteney bridge. Always a venue for a pint or two when on my - sadly rare - trips to Bath. Love the atmosphere, the music and the beer and cider. It won the CAMRA local POTY last year. This pub has been made famous by a visit last spring by Nigel Farage. It is here where the "Farage Wave" was born. If I see you Gary, the beer's on me! This place was bought my regulars past and present when the previous Landlord decided to sell up. A hugely successful fundraising effort followed and the community manage to raise the funds and buy the place. I am pleased that I was able to contribute along with several celebs who also got their wallets out. Including Robert Plant from the mighty Led Zep! It is now a community owned pub and we all have a say in the future. 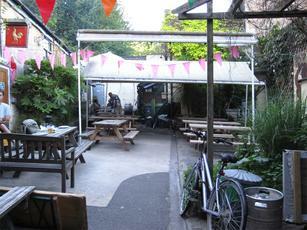 I was told the long term landlord has sold up, but it's been 'saved' by hundreds of customers who bought the freehold. A figure of nearly £1m was mentioned, that's Bath for you. There is scaffolding up so looks like it's getting a spruce up, probably not before time! Good choice of ales, some laid back drinkers and lots of music on offer but I still prefer some of the city's smaller venues.